The days are starting to get colder, but we aren't letting that bring us down. At Vango, we're far too excited about the launch of our brand new Vango Awnings! From versatile drive aways to luxurious caravan awnings, we are sure you will find the perfect addition to your vehicle in our new collections. For 2018, we have introduced three new awnings to our inflatable collection, featuring our pioneering AirBeam® technology and fantastic new designs to make your caravanning, motorhome and campervanning holidays even better! Each of our caravan and drive away awnings encompass trusted materials, innovative technology and must-have features to suit all occasions, whether you are heading out for a weekend or treating the family to a week at the holiday park. Within our drive away collection, there are two brand new awnings which are the Galli II Compact and the AirHub Hexaway! As you can probably guess by the name, the Galli II Compact has been created as the little sister to our Galli, combining all of the benefits yet in a compact size. The ideal awning for short weekend getaways with family and friends, or a longer trip where you want more living area outside your campervan or motorhome. 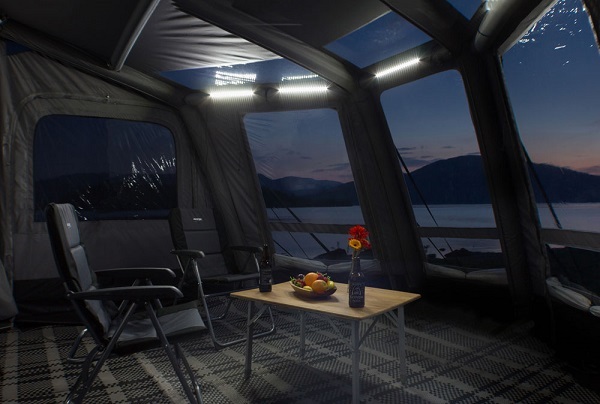 The Galli II Compact includes skylight windows which allows daylight to flood the awning and provides perfect stargazing option at night. The 2 external doors in the connecting panel makes life that wee bit easier for access to the back of your van or allow additional storage for bikes or prams. If that wasn't enough, this attaches side onto your vehicle, ensures you are always facing the view! Also brand new drive away is the AirHub Hexaway! Designed for campervanners or motorhomers who would like a more gazebo-like structure to accommodate for families, friends and pets. The Hexaway connects directly on to the side of your campervan which is perfect for relaxing, as an additional storage area or even for kids toys and your bikes whilst you go off exploring by foot! Alternating mesh and Diamond Clear windows allow ventilation and light to flood into the awning, with built-in zipped curtains for extra privacy when needed. The AirHub Hexaway is also fitted with our SkyTrack™ system, allowing lights and storage to be hung from the beams, allowing you to feel even more at home! For all you caravan lovers, we have a brand new awning for 2018 which introduces a fresh concept into the Vango caravan awning range, allowing you to have a great amount of flexibility for your awning you can attach a left and right-hand extension onto the side to create an even bigger living space for you and your family. 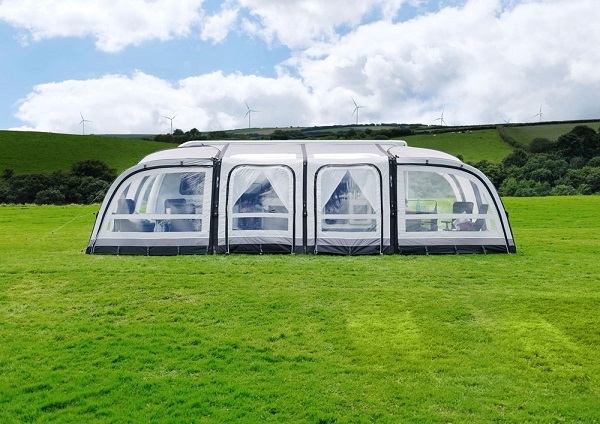 This is the Varkala Connect, which not only offers great flexibility and interchangeability but also features our trusted Sentinel Pro 420 fabric making this an extremely luxurious awning for your caravan. Additional features include Vango's SkyTrack™ II system to suspend lights and storage, smooth curve beams for extra headroom , and skylight windows which draw in the daylight and allow you to stargaze when the stars appear. The Connect expands to meet your needs, ensuring all of your caravanning trips are stress-free and enjoyable at all times! Still fancy the look of our 2017 awnings? We have continued with the favourites but updated these with fresh and unique features to bring them up to date! A fantastic new feature now built-in to all of our drive away models and a few of our caravan awnings is the Skylight windows! We know how much you love a great view from your holiday park, that’s why we have introduced these handy windows, which run along the roof line to flood your living area with light during the day and allow you to stargaze at night! Another practical yet versatile feature now included throughout the drive away and caravan range is our SkyTrack™ II system! Our SkyTrack™ II system has proven very popular within our tent range. This truly innovative feature has now been integrated into our caravan and drive away awning collections to make hanging storage and lighting simple! The Vango SkyTrack™ II system is extremely versatile, allowing you to hang lanterns, storage and our new SkyLiners for awnings. 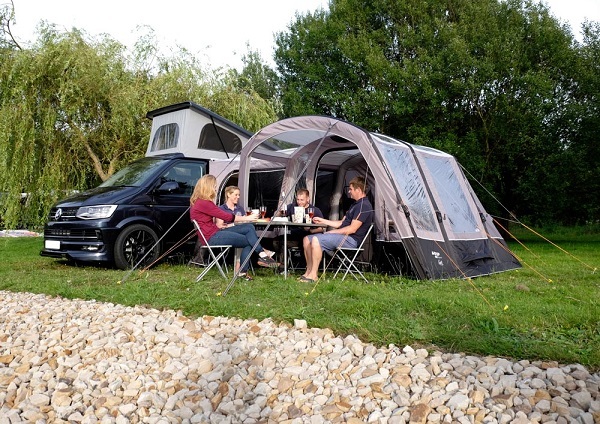 The Vango SkyLiner is designed to attach to the roof inside your awning which will help to reduce the effects of condensation and create a thermal barrier in cold weather! In our drive away awnings, these can also cover the roof skylights, enhancing shade and privacy when desired. These additions are supplied with Skyhooks and simply slide onto the SkyTrack™ for easy fitting and removal. 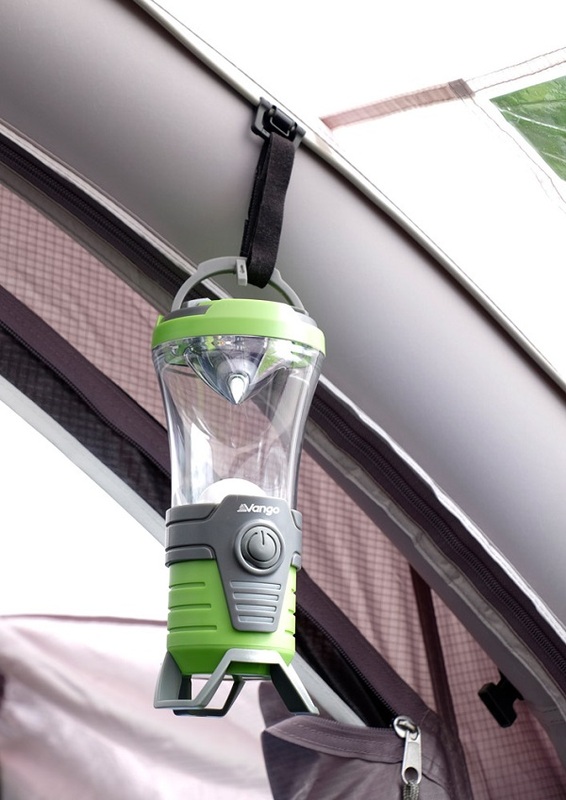 Our Skyhooks can also be used to hang lanterns, making it easier to brighten up your tent when the sun goes down! Another brand new addition for caravan and drive away awnings are our Sky Storage organisers, designed to integrate seamlessly into your awning using the SkyTrack™ II system. 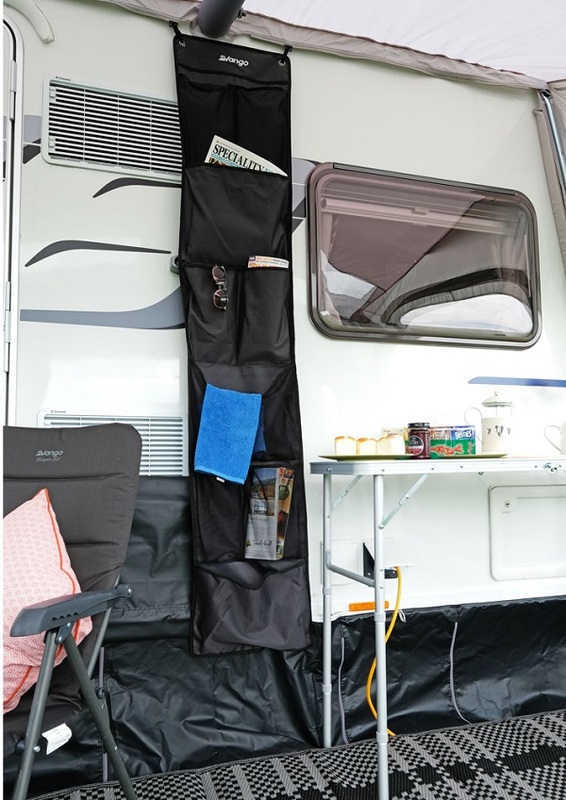 These pocket organisers simply hang inside your awning and provide additional storage options to keep your living area clean and tidy! Last but not least, pre-attached to all of our drive aways is our new orange reflective guylines designed not only to stabilise your awning in high winds but also prevent hazards thanks to the high visibility lower half, making it safe for all ages of the family!